Businesses are surrounded by floodwaters from Harvey, in Humble, Texas. 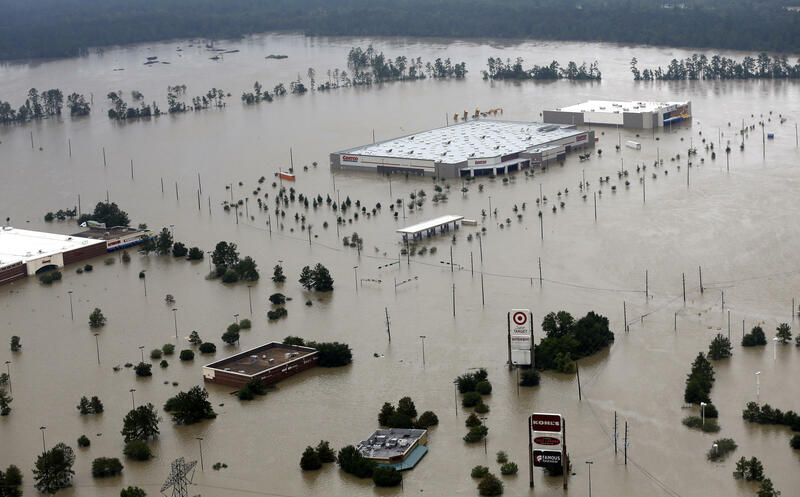 Oklahoma energy businesses who operate in Houston and the Texas and Louisiana coast have been affected by Hurricane Harvey’s massive flooding. This week on The Business Intelligence Report, Journal Record senior reporter Sarah Terry-Cobo discusses the storm’s impact on Oklahoma's energy industry. Journal Record senior reporter Sarah Terry-Cobo talks with Jacob McCleland on KGOU's The Business Intelligence Report. McCleland: This is the Business Intelligence Report, a weekly conversation about business news in Oklahoma. I'm Jacob McCleland. I'm talking today with Sarah Terry-Cobo. She's a senior reporter at The Journal Record newspaper. Sarah thanks for joining us. Terry-Cobo: Great to be here Jacob. McCleland: Sarah, Hurricane Harvey has devastated Houston and the Texas and Louisiana coast. This is an important area for the energy industry with refineries pipelines and ports. How is the flooding and damage there impacted Oklahoma's energy sector? Terry-Cobo: Well we have a handful of Oklahoma based companies with operations and infrastructure in and around Houston and in South Texas generally. So employees at the Tulsa-based pipeline business the Williams Companies were working remotely earlier this week rather than at their tower. There was no power at the tower. And in some places floodwaters were so high, workers couldn't even get to the pipeline pump stations to see if equipment was OK. The good thing is they can monitor those things remotely and so far no problems there. McCleland: Now there are some other Oklahoma pipeline companies working in the area, like Magellan and ONEOK Incorporated. Have they been able to continue operations? Terry-Cobo: They've been able to restart some things this week. So Magellan as of late Wednesday they were able to safely reactivate a pipeline that feeds refined petroleum products from Texas City into Houston. However operations for some of their other Houston area product pipelines are still suspended. And then ONEOK has another facility, a pipeline facility, in Mont Belvieu, Texas. That's a natural gas hub. It's operational, but it didn't suffer significant damage from Hurricane Harvey, but a lot of their pipelines in the area are under reduced capacity because of other refineries and processing plants in the area are just shut down. McCleland: Well what about Devon and Chesapeake. Have there been any impacts on their business? Terry-Cobo: Yes it is a little bit unclear what those effects are right now. So we know Devon Energy and Chesapeake Energy both have drilling operations in what's known as the Eagle Ford Shale and that's kind of between San Antonio and Houston. Production is expected to be down when they report for the next quarter but it's unclear by how much. However, the energy information service S&P Global Platts reported Wednesday night that gas production in the Eagle Ford generally has rebounded. McCleland: How is the closure of the port at Houston affected Oklahoma energy exports? Terry-Cobo: Well the port closed that's halted its exports of commodities like crude oil and gasoline at least for a little while. And the energy service I mentioned earlier, Platts, says natural gas exports to Mexico are down 20 percent for the month to date average prior to the storm. There is a pipeline from Texas to Mexico and operations were halted on that pipeline. McCleland: Are there alternative ports for oil and gas exports besides the one at Houston where commodities can be can be shipped to? Terry-Cobo: Well I mean as far as exports go a good chunk of it is in the Gulf Coast area which includes Texas and Louisiana mostly. There are ports in Los Angeles and in Richmond, California. That's in the Bay Area. And then along the East Coast in New Jersey. And according to Platts the liquefied natural gas operations have resumed at the nation's only LNG export terminal. That's Sabine Pass in Louisiana operated by Cheniere Energy. McCleland: Now the Oklahoma Department of Emergency Management has sent several water rescue units to Texas. Companies and individuals have been donating money to relief. It also sounds like Oklahoma power companies are contributing quite a bit of manpower to restore electricity in southeast Texas. Terry-Cobo: Right. Oklahoma Gas & Electric sent in linemen and other crews to the area to help get lights back on this week. It's part of an agreement utility companies have with one another in the region. It's called mutual aid. Earlier this week I saw a convoy of bucket trucks headed south on Interstate 35. Those workers were likely headed there to the Houston or to those outlying communities. Terry-Cobo: Now are you aware of any organized efforts to help shelter displaced people here in Oklahoma? McCleland: Well sort of. We do have Oklahoma hospital staff ready to treat patients who have been transported out of the Houston area. There is a triage center set up near Will Rogers Airport and medical providers from OU Medical and St. Anthony's are some of those who will be there to provide that triage and determine where to send those patients next. McCleland: Sarah Terry-Cobo is a reporter for The Journal Record newspaper. Sarah thank you so much. Terry-Cobo: Hey thanks for having me Jacob. McCleland: KGOU and the Journal Record collaborate each week on the Business Intelligence Report. You can find this conversation archived at KGOU.org. And you can follow us on social media. We're on Facebook and Twitter. We're @journalrecord and @KGOUnews.